Diaspora Tapestry Heads NE for a Return to Helmsdale - with all 305 Panels! 16-Aug-2017 Back to Helmsdale so they can see not 157 panels but now the full 305! It was October/ November 2014 when the half completed Diaspora Tapestry headed NE to Inverness, Wick and Helmsdale. Now nigh on 3 years and a tour around the globe later Jenny Bruce and her colleagues are taking it back there - to Helmsdale. 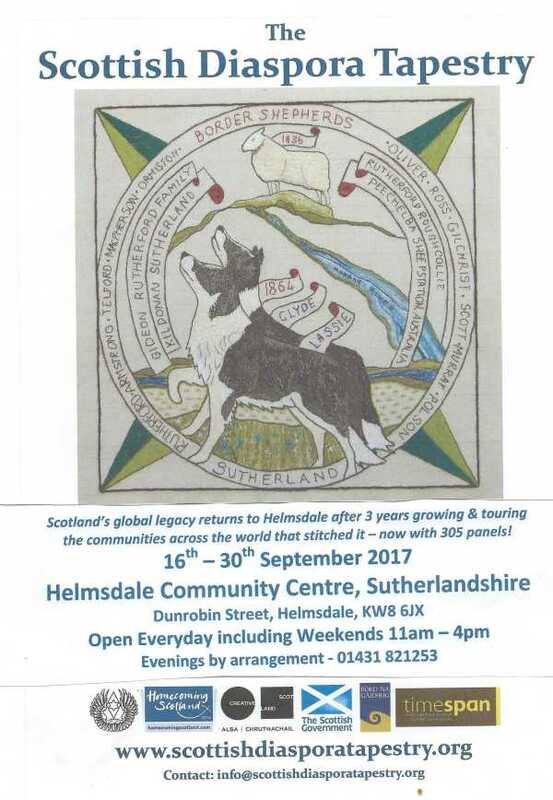 The exhibition is open every day of the week and its merchandise will include special representations of the Helmsdale Collie Panel that has proved so popular - and appears on the poster below.